840's concert featured bassoon and double bass – an instrumental combination that should occur far more often than it does. In the hands of virtuoso performers Joe Qiu (Bassoon) and James Oesi (Bass) this duo’s great potential for resonance, agility, and gravity was explored in a diverse programme of new and pre-existing works at Iklectik Art Lab near Waterloo, an exciting new venue for 840. Mary Jane Leach's Feu de Joie for multi-tracked bassoon and James Tenney's monolithic Beast for solo bass both immerse the listener in the singular sound-world of each instrument. 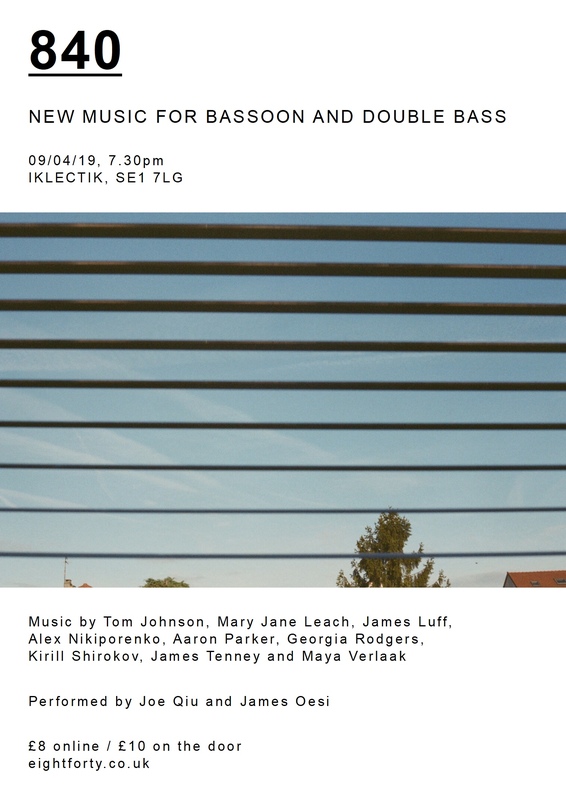 And Tom Johnson's Failing for solo bass gives an entertaining and theatrical narration through 'a very difficult piece.’ Turning 80 this year, Johnson is renowned for his rigorous and exploratory pieces of great clarity, laying logical processes bare for all to hear. Alongside these pre-existing solo works, there were pieces composed especially for the concert by some exceptional voices in contemporary European experimental music. We’re delighted to feature Maya Verlaak, a composer who is also active as a performer, curator, guest speaker, researcher and lecturer. Her music often scrutinises some aspect of a given context in ever-surprising ways (such as place, musician, instrument, etiquette, conventions, history). There was also a new work from Russian composer, improviser, poet and pianist (The Same Ensemble) Kirill Shirokov, who writes sparse and introspective music, often imbued with a feeling of distanced and haunting innocence. The programme also featured a new work from Georgia Rodgers, whose refined and exposed music often focuses on textural and spatial aspects of sound and the experience of listening, as well as a piece from Aaron Parker, who writes instrumental and electronic music informed by a love of landscape, film, visual art, and sound. Hard to categorise yet totally distinctive, his works employ beguiling surface textures, a unique ear for timbre, elusive, ever-shifting melodies and a stately sense of pacing. 840’s curators James Luff and Alex Nikiporenko also wrote new pieces for the concert.